A group of people are seated at a round table. In the middle is a man with glasses. Man with glasses: Our 787 airplanes are still grounded. We're losing money. Boeing still hasn't fixed the Lithium Ion batteries that catch fire. A closer view of the group is seen. Man with glasses: We'll have to fix this ourselves. 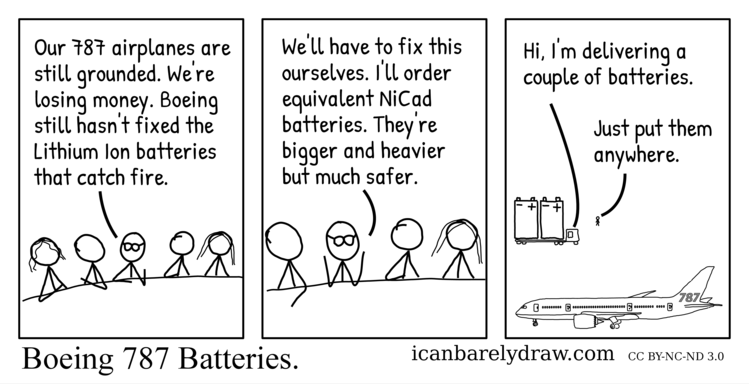 I'll order equivalent NiCad batteries. They're bigger and heavier but much safer. The last and final panel shows a Boeing 787 in the foreground. In the background a large truck is seen. Loaded on the truck are two very large batteries, taller than the truck and taller than the Boeing 787, with positive and negative terminals visible and clearly labeled. Voice from truck: Hi, I'm delivering a couple of batteries. Man standing nearby: Just put them anywhere.